December is a bit crazy with me since I have finals but I'm still trying to post at least once a week - definitely not on the typical days. I wanted to upload a quick post about what eye makeup remover I love to use. So here's a bit of background on me: I am a contact lens wearer, I have really sensitive eyes and do not wear waterproof eye makeup on a regular day basis. I hate eye makeup remover that feels super oily , most drugstore makeup brand ones I've tried have bothered my eyes like crazy because they feel so greasy when I use it. I need a really gentle makeup remover and I hate using scented eye makeup remover near my eyes because they're so sensitive. I finally found a really good one that you can also purchase in a formula that can be used for waterproof eye makeup as well. The Body Shop Camomile Gentle Eye Makeup Remover. They've made the packaging prettier since I bought my last bottle. It lasts a really long time, I use one cotton round saturated with this and it removes all my eye makeup on both eyes. I hold it to my eye for about 2-5 seconds and then wipe, mostly everything comes with it but sometimes eyeliner and mascara needs to be rubbed a little more with it. This is seriously the most gentle eye makeup remover I have ever used and it's the only one that has not bothered my eyes. It doesn't have a harsh fragrance either. 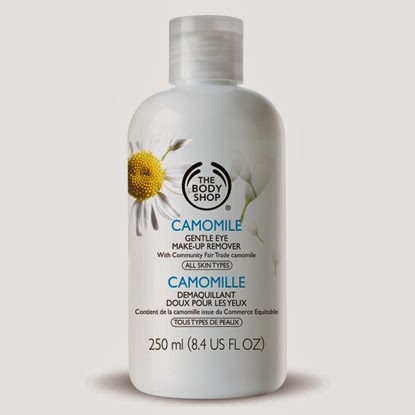 It retails for $16 CAD but The Body Shop always has really good sales and right now on the website it's 40% off and priced at $9.60. I highly recommend to all of you contact wearers with extremely sensitive eyes!